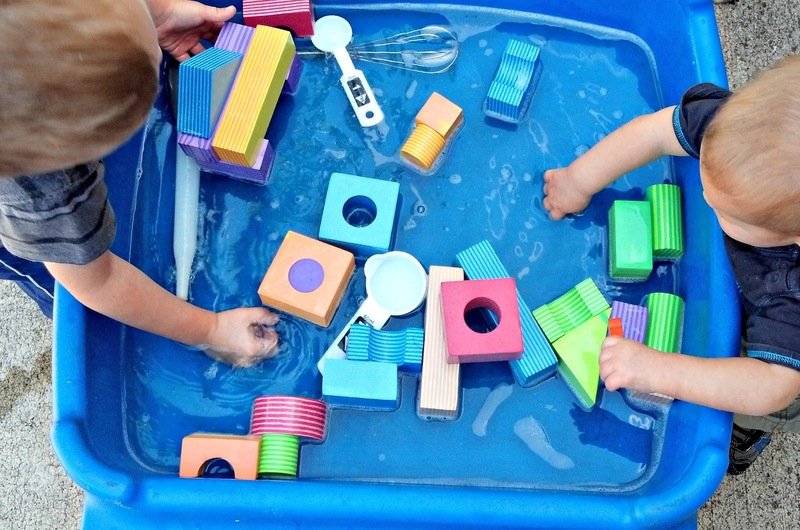 I do my best to offer my children a variety of options to facilitate their play, for example, we have six different kinds of blocks, each with their own unique features. 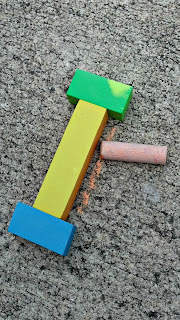 The latest addition to our collection was the foam block. 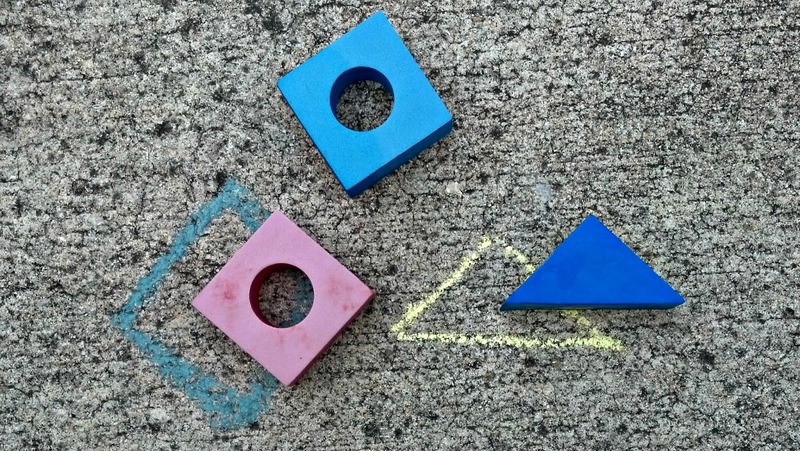 While offering a variety of blocks has its benefits, using each kind of block in different ways offers additional advantages for building math and critical thinking skills. 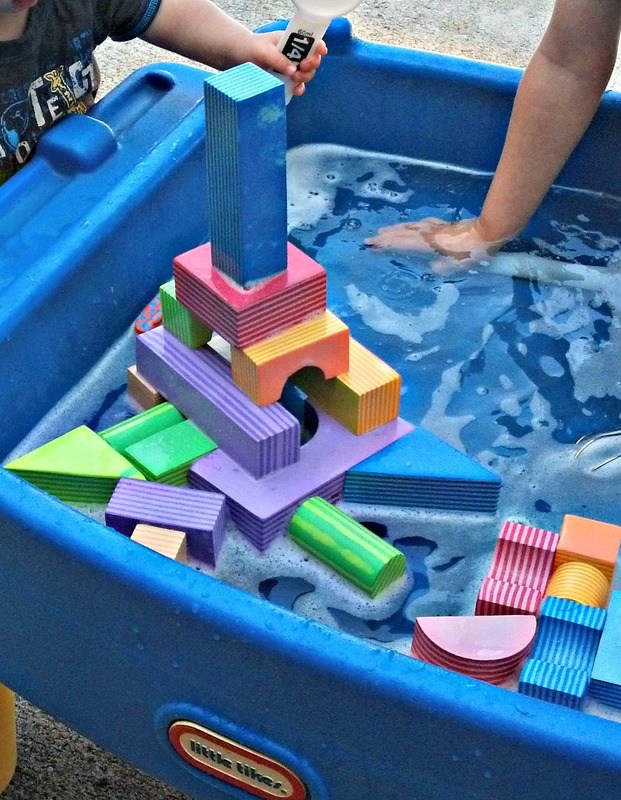 Lately we've been using our foam blocks in some non-traditional ways. All you need to add is water, and bubbles if desired! 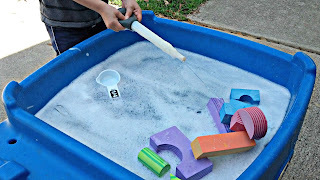 Experiment on this unstable surface and children will find out how different balancing works on water. Most children start out using blocks for the sole purpose of knocking them down when they are babies and toddlers, so I added a baster, and my kids used water pressure as a way to knock down their structures. We took turns building and trying to knock each other's creations down. Knocking stuff down is still fun no matter how old you are! 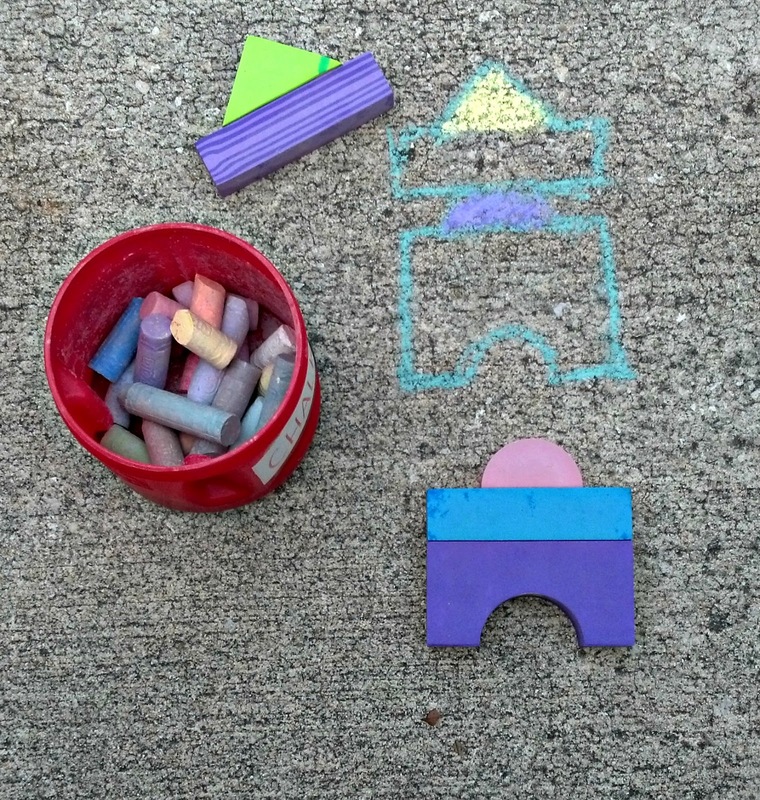 Instead of building vertically, we built horizontally on our driveway and added chalk. We traced and colored different layouts, named the "towns" we created, and then used the blocks to forms letters to trace out the names. 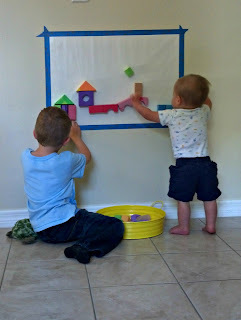 The same can be done on large paper with marker, crayons, or paint! Contact paper's sticky surface is strong enough to hold lightweight blocks, and can stand up to many changes in building plans. Tape down all sides of your contact paper sticky side up on the floor, or a wall. I like to use painters tape so my walls don't suffer! 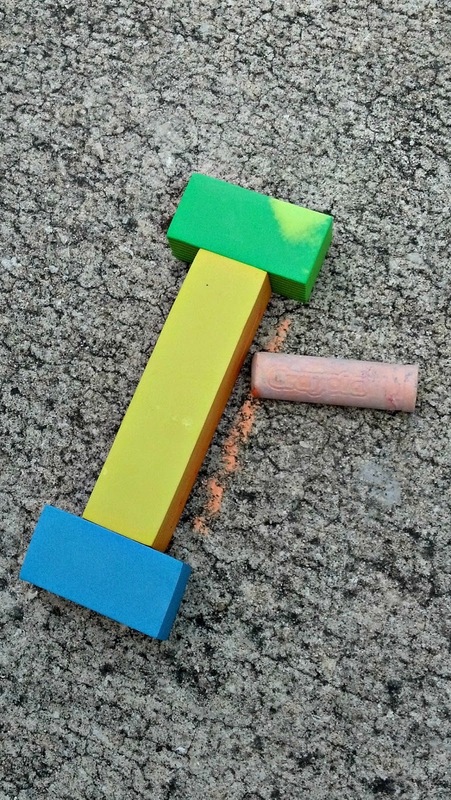 For this particular activity, it helps to encourage your children to think like a brick layer. Offer a variety of spreading tools from your kitchen, add a bowl or pile of shaving cream, and start layering. Shaving cream creates a bond and makes the blocks stick together a little, just like water does with these blocks. 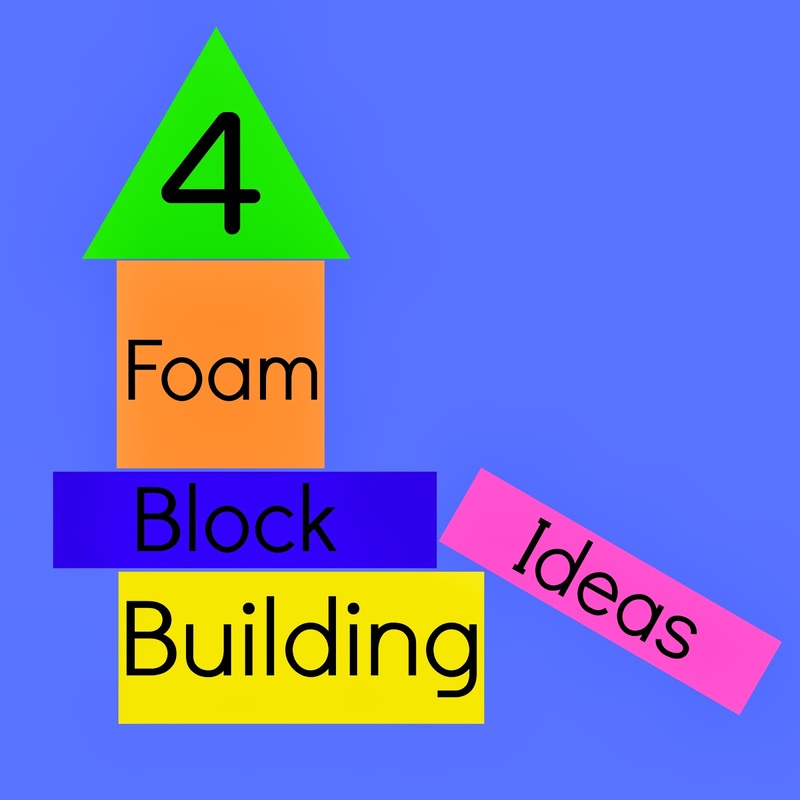 I hope you try out one or some of these great alternatives for building and creating with foam blocks. We had fun exploring new territory with our building. Wouldn't your future carpenters, engineers, or architects enjoy a new sensory experience with blocks? 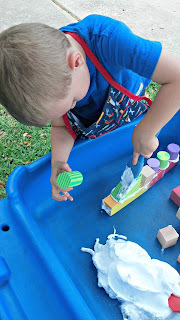 These are great ideas- particularly for people trying to stretch $$ and toys without sacrificing play possibilities! Glad you like! 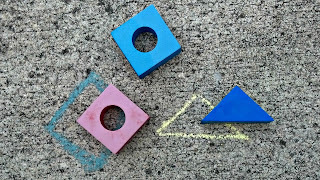 My goal is to pass on 'outside the box thinking" to my kids! These are great - especially the sticky wall and the shaving cream. 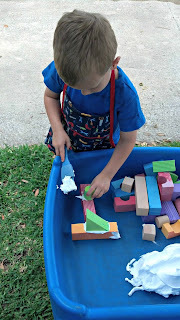 My guys loved their foam blocks as babies and toddlers but I was beginning to think they no longer cut it for the preschool set. Will have to try this as I think they would get a huge kick out of it. Thanks for sharing. Presenting something in a new and interesting way will usually result in a different kind of play. Good luck! 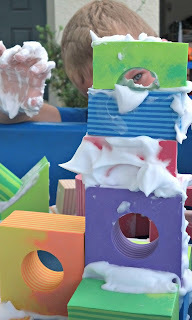 I really love the blocks on the sticky paper and 'gluing' them with shaving cream!! 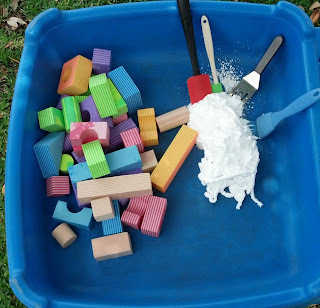 Love these ideas & they are so easy for anyone to replicate, thanks so much for adding this to the outdoor play party this week too. What a lovely way to learn and build, great that it can be enjoyed outdoors too. Popping over from the outdoor play party. I would be delighted if you would join me on Country Kids too. Love your ideas for the blocks! I'm featuring your post on this week's Sunday Showcase. What fabulous ideas - I love them all. 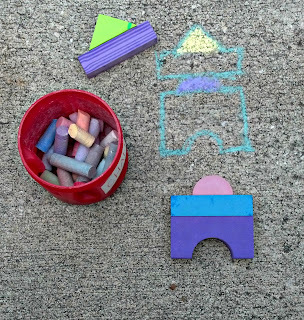 Am going to have to get some foam bricks so we can do some of these. These are great ideas. 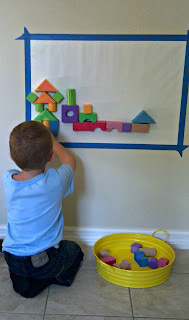 I especially like the contact paper wall art and can't wait to try it with mine.